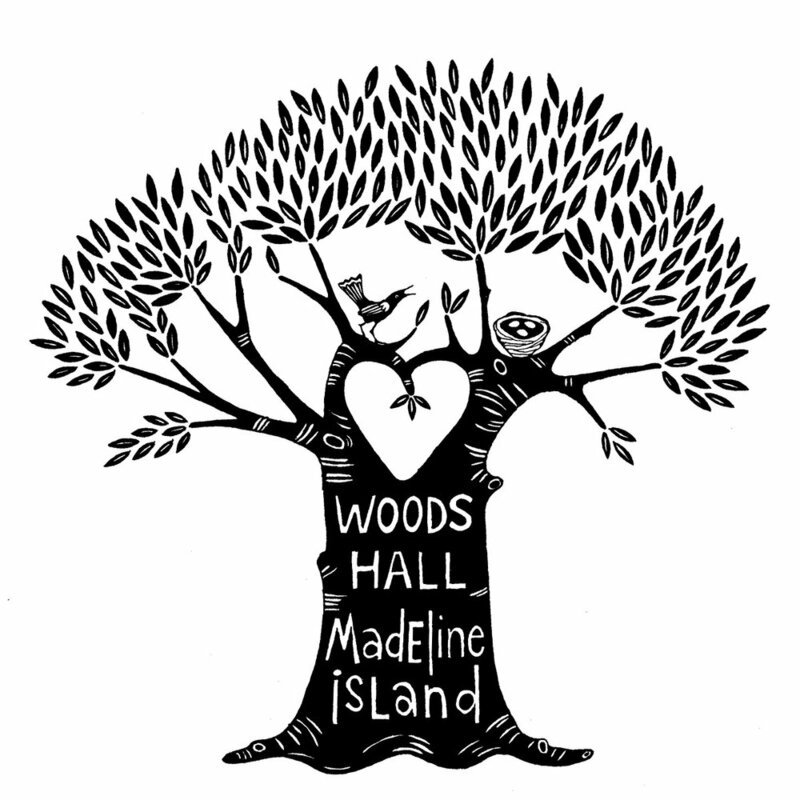 Madeline Island has always had a seasonal economy, with work available primarily from late May through early September. Because of this, year-round islanders have always struggled with how to use their time during the winter to provide for themselves and their families. To address this very real concern, Woods Hall was founded by St. John's Church in the early 1950's as an outreach to the community. The goal was to keep islanders busy during the winter weaving rugs and creating other craft items, so that their products once sold during the season, would provide a supplement to their summer earnings. When the program began to show promise, the craft shop and studios were built with generous financial contributions from the Woods family, along with contributions of time and expertise by many Island carpenters, craftsmen and volunteers. Woods Hall to this day provides a venue for many winter islanders to increase their earnings. Because the island community, including both year-round and summer residents, has always been close-knit, Woods Hall opens its membership to anyone with an island connection. During the whole year the island community benefits from the availability of the studios and workshops and camaraderie — and an opportunity buy and sell wares. Woods Hall is an association of artisans and their supporters. The artisans involved contribute their time, performing maintenance and working in the shop, in exchange for an increased percentage on the sale of their wares. Members constantly reach out to other islanders in search of the joy of creating, inviting them to join in the fun. Woods Hall is a fostering and nurturing community for artisans on the island....it is a place of teaching, sharing and learning, and a haven of mutual support. Presently, over 70 artisans display items for sale at Woods Hall. About one third of the participants are year-round island residents; others reside here in the summer or have another connection to Island living. Woods Hall has a very active Friends group which supports and strengthens the association in numerous ways. In the winter Woods Hall is an busy place: weavers and potters and other artisans are hard at work creating items to be sold in the coming season. Recently a mosaics group has been using the studio on a weekly basis. The winter season features workshops in weaving and pottery, and sometimes other crafts as well. There are always skilled workers on hand to offer advice and demonstrate techniques to those still learning or improving their craft. A knitting and crocheting group meets weekly at the town library. There are spontaneous workshops at various homes on the island when someone comes up with a fun idea. Those with studios in their homes (or a chair by the fireplace), either on the island or at their winter abodes (maybe a chair on the beach), also keep busy designing items for future sale. Artisans continue to create even when the shop is open. During the season the shop features craft demonstrations on a regular basis, and a variety of workshops with local and guest instructors are scheduled as well. The shop is open daily from June through early October, and has extended weekend hours during the shoulder months. See our hours at the bottom of this page. The shop is open on occasion during the off-season when there are special holidays, island events, or sometimes when the ice road is good. Please check our calendar for dates and times. Woods Hall has come a long way....from a few individuals learning to weave with a loom found in the attic....to a breadth of artisans contributing to the diversity of products for sale....from candles, soaps and bath salts to wood carvings and metalwork, from books, cards and prints to dolls and knitted socks, from pottery, garden art and jewelry to lake stones and rock people, and yes....a wealth of rugs!